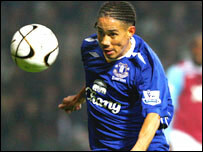 Everton have completed a £2m permanent transfer for on-loan midfield man Steven Pienaar. The 26-year-old South African international has agreed a three-year contract after a successful season at Goodison Park. Pienaar had earlier expressed fears that the deal had stalled, but Everton boss David Moyes was always confident a deal was in place. Moyes said: "Steven is one of the reasons our football has improved." He had been linked with Arsenal, Newcastle and Valencia but insisted he was happy to extend his stay at Goodison Park. Pienaar, a product of the South African arm of Ajax's youth academy, has played 35 games this season scoring twice so far.